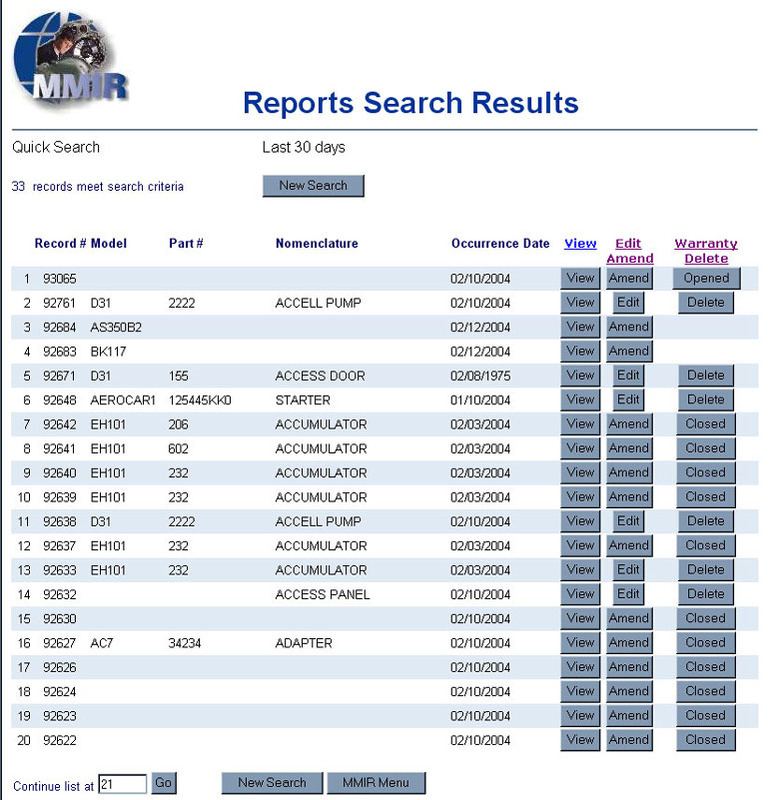 This will take you to the MMIR search screen. Use the Comprehensive Search section to select the parameters you want to search. The Quick Search pull-down menu gives you the additional option to review all reports from today, the last 3 days, or the last 30 days. The other option, a Record # search, is highlighted in yellow on the screen below. If you happen to know the MMIR Record #, you can enter it here and click Go! In the Comprehensive Search menu, you can search on any or all of the parameters listed. The exception is whether to search on Aircraft, or Aircraft Model. 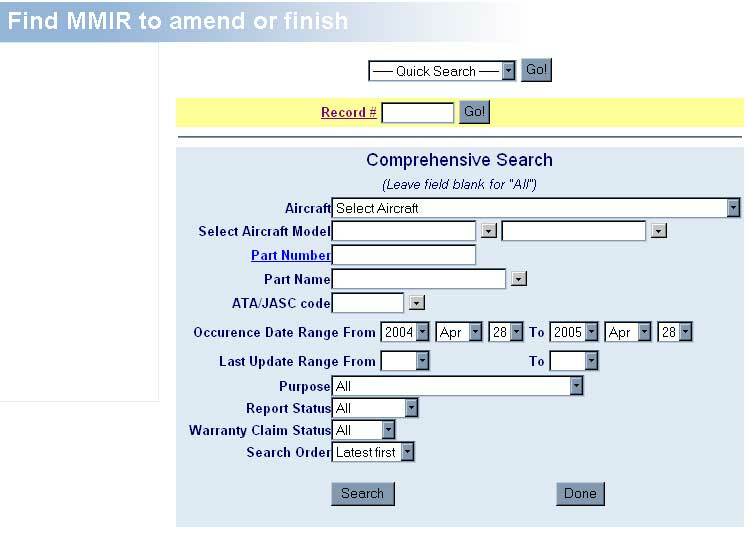 The pull-down menu for "Aircraft" is the listing for your fleet only, as culled from your MMIR fleet information. 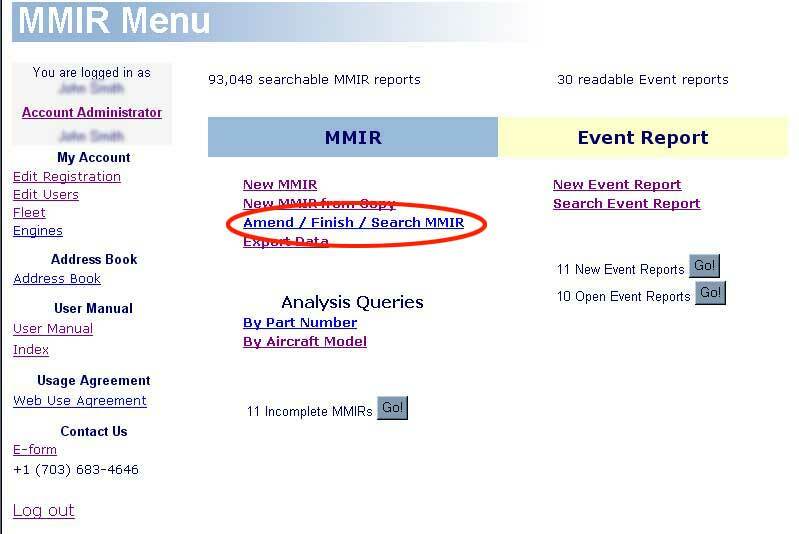 So, you can search for reports on a specific aircraft in your fleet. The other option is "Select Aircraft Model." These are the manufacturer and model pull-down menus that let you select reports for a specific model, rather than a specific aircraft. Obviously, "Aircraft" and "Aircraft Model" may conflict. Therefore, MMIR lets you search on either parameter, but not simultaneously. You can view the reports in a read-only format by clicking the View button. Simply viewing the report will not assign your initials to the report. However, if you edit or amend the report, your MMIR initials will be assigned, along with a time-date stamp. Warranty Claims (including Warranty Claims combined with SDRs) include another option. In Chapter IX, you learned about using MMIR to submit warranty claims. On the MMIR form, you can designate a Warranty Claim as Open or Closed. On the Reports Search Results screen (above), the far right column gives you the option to change the claim status between Open and Closed, even after the warranty claim has already been finalized and can no longer be edited. The buttons in the far right column indicate whether your submitted warranty claim is "Opened" or "Closed". From this screen, you can change the claim status simply by clicking on the button corresponding to the report. For example, in the first listing above (Record # 93065), the far right button says "Opened," indicating the warranty claim status is open. To change the warranty claim status to Closed, simply click the button once and wait for the button to update itself (a few seconds). Of course, if you have not finalized the warranty claim, just click the "Edit" button and change anything you want directly in the report.
! Tip MMIR "knows" if a warranty claim is unfinished or already submitted, Open or Closed. Only the appropriate buttons will be available to you.